Canadian Investor Financing. 7 Secrets to getting all the money you want: Our Amazon top Selling book. Financing is the backbone of real estate investing, and there are many strategies available to you, as an investor, which you can utilize to grow your portfolio and enhance your returns. 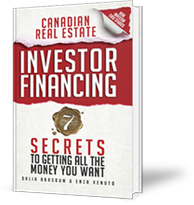 This book is packed with field-tested, up-to-date financing strategies and tips for both the starter and sophisticated Canadian real estate investor. Covered in great detail are the many traditional and innovative financing techniques that you can utilize throughout your investment journey. We also share real clients’stories on how they successfully leveraged some of the strategies we talk about. As investors and mortgage brokers specializing in working with real estate investors, we believe that financing should not be a black box where you submit an application to a lender with the hopes that it will be approved. It is a crucial component to your success that you are well-informed as the CEO of your business. With this knowledge and the many strategies available to you, you are better equipped for your investment journey. You will be able to plan better, avoid costly mistakes and build a successful investment business based on a solid foundation.